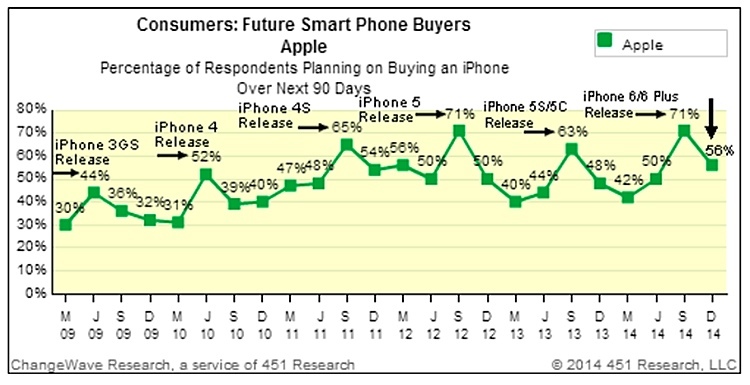 Both analysts and metrics are suggesting Apple will report record-breaking iPhone sales for the just-ended December 2014 calendar quarter, and new data released today by Consumer Intelligence Research Partners reveals the Cupertino company may have set a high bar against its competitors, grabbing half of all phone activations in the United States. 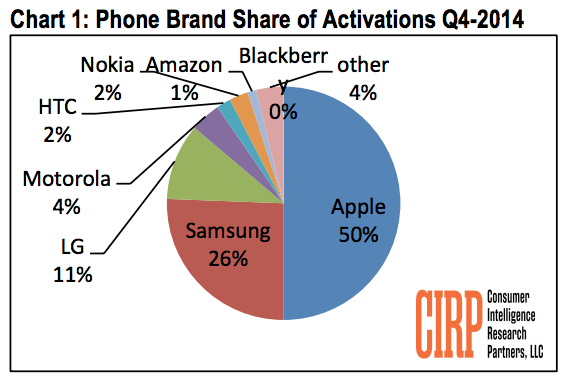 While CIRP's survey included only 500 users and thus may include a significant margin of uncertainty, the data shows Apple's U.S. activation market share increasing from 28 percent in the July-September 2014 quarter to 50 percent in the October-December quarter. The significant jump was clearly fueled by strong consumer interest in the iPhone 6 and 6 Plus. "The strength of the September 2014 launch of the iPhone 6 and 6 Plus fueled Apple’s dominance in US mobile phone sales this quarter," said Josh Lowitz, Partner and CoFounder of CIRP. "Apple had virtually double the sales of Samsung, and five times that of LG. No other brand accounted for as much as 5% of US sales." CIRP's survey also found that most of the quarter's iPhone purchases (86 percent) came from loyal Apple customers who upgraded from older iPhones. While Apple retained its customer base, Samsung and LG lost customers, with 25% of Samsung owners and 18% of LG owners who activated a new phone switching to an iPhone. Sales of the iPhone 6 and 6 Plus may continue to be strong in early 2015, with a high numbers of consumers intending to buy an iPhone in the next three months. According to 451 Research’s ChangeWave December survey, more than half of early adopters plan to buy an iPhone when they purchase a new phone in the next 90 days. While the number is down significantly from the previous quarter, it remains high considering the new iPhones have been available for several months already. "This is the highest level of Apple demand ever recorded in our smartphone survey three months after a major new release," said Andy Golub of 451 Research. The ongoing demand for the iPhone 6 and 6 Plus reflects growing consumer interest in larger phones with 60 percent of future buyers looking to purchase a 5-inch or larger smartphone. This 2014 figure is a significant jump from the 40 percent ChangeWave recorded in the same quarter of 2013. Apple released the iPhone 6 and 6 Plus in September 2014 with long lines for the phone and delayed ship times shortly after the phones went on sale, and Apple announced record-breaking sales of 10 million units in the first weekend of availability. Apple will announce the results for its first fiscal quarter of 2015 (fourth calendar quarter of 2014) on Tuesday, January 27. The quarterly earnings statement will be released around 1:30 PM Pacific/4:30 PM Eastern, with a conference call to discuss the report following at 2:00 PM Pacific/5:00 PM Eastern. 500 is a pretty small sample size for 9 variables, right? Blackberry 0% new activation. Zero? Really? "No one will want an iPhone 6 Plus. It's too big!" "iPhone 5c AND 5s? No one wants two phones." "The 5s is $100 more for just a fingerprint sensor? No one will want that!" Seems like they're doing it right. I'm saying this as a happy iPhone user; I would have assumed Blackberry would have been at least 1%. Apple kicking some serious tail!! Love it! they couldn't move 'other' over a smidge? I sure hope this company is better at collecting data than they are at putting it on a chart or graph. iPhone 6 is not too different from budget Moto G since they both have 1GB DRAM, equivalent screen size/resolution, do pretty much the same, etc. A high cost Android phone like a 2013 or even 2012 Galaxy Note wouldn't be a fair comparison since it has more DRAM, precision pen input, AMOLED, advanced features like split screen multitasking, etc. In the same way a Porsche 911 isn't too different to an Elantra; they both have 4 tires, brakes, headlights, taillights, steering wheel and gas pedal. Oh and apple is heading to a record breaking quarter, how is samsungs mobile phone business doing? iPhones are made in China just like Moto G and not in Germany. Newcomers like Xiaomi are taking away marketshare from both #1 Samsung and #2 Apple. And hyundais are made in korea, not china. But porsches perform better with a 6 cylinder 3.8 liters engine than american cars with 8 cylinder 7 liters engines. They are more expensive too. The average redneck still thinks his camaro is better of course anyway, the numbers are bigger you know.